← Has the 2018 currency reset predicted by The Economist in 1988 begun? Who’s trying to kill George Soros? 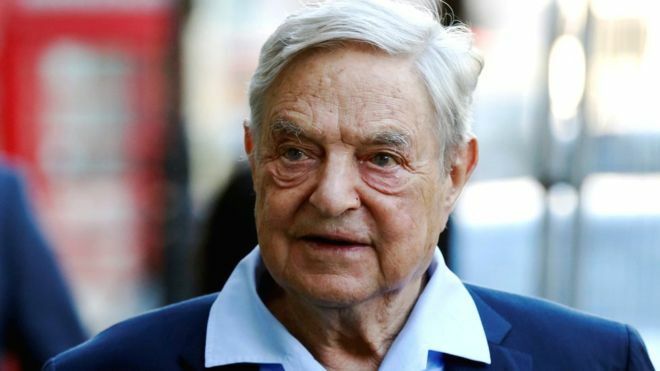 New York police say they have safely destroyed a suspected letter bomb found at the home of billionaire businessman George Soros in New York state. The package was discovered in a post box by an employee of Mr Soros who alerted the authorities before taking it to a nearby wooded area, police say. The incident on Monday afternoon is now being investigated by the FBI. He was not at his home in the town of Bedford in Westchester County at the time of the incident, according to reports. “An employee of the residence opened the package, revealing what appeared to be an explosive device,” a Bedford Police Department official told the New York Times. Officials say that police received a call about a suspicious package at about 15:45 local time (20:45 GMT). Bomb squad technicians later destroyed it. The FBI tweeted that it was investigating an incident in the area. The 88-year-old Hungarian-American businessman earned his fortune through shrewd financial speculation. He has spent billions of his own money funding human rights projects and liberal democratic ventures around the world and has been a large donor to the US Democratic Party. He previously backed the presidential campaigns of Barack Obama and Hillary Clinton, and labelled US President Donald Trump “an imposter”. US-based right-wing conspiracy theorists and websites have accused Mr Soros of secretly engineering a range of recent events in US and global politics. They have alleged he was involved in recruiting crowds for the anti-Trump Women’s March and even organising violence in Charlottesville to undermine the country’s political right wing. Mr Soros has also become a political target worldwide for nationalists and populists, who paint him as a master manipulator of democracy.